Stunning Villa with stunning views of the ocean and the beach (which is accessible directly through a staircase). Located in a secure private residence, it has a large terrace and a private pool with shower, from which you can admire the sea as far as the eye can see. The feet in the water, in a quiet place rocked by the songs of the birds, its ideal location will make you spend your most unforgettable stay: just a few steps from a long deserted beach, fishermen and hikers will find their happiness; for golf lovers, a course is located nearby. The village, accessible on foot, will allow you to go shopping but also to eat in the restaurant and taste the specialties of Senegal, but also to meet the inhabitants of the village, who will welcome you with open arms. We had a fantastic 4-day stay. The house is modern, clean and convenient with all needed amenities (AC, fans, microwave, Cable TV for a fee), a beautiful pool and easy access to the beach. The staff (housekeeper, gardener and taxi driver recommended by owner) were all extremely helpful and cordial. We had delicious fish and shrimp meals along with the best mangoes! All in all,it was a wonderful experience. We will be back, soon we hope! Anne Lucie et sa famille sont des gens charmants, ils ont été appréciés de tous. Je recommande cette famille à 100% en espérant qu'ils reviennent lors d'un prochain séjour. Home is comfortable and well appointed. New pool is a added feature. Housekeeper, Sophie, is a great cook. We ate out a few times but nothing compares to the view from this house. Hire Sophie and eat in. Taxi man, number in the house, is very helpful finding all of our provisions. According to my daughter and son-in'-law who have lived in African counties for 10 years, he was invaluable. "The house was all we hoped for and more - We were greeted by the lovely Mamadou and Papis who look afer the property. Mamadou is the night guardian and he was always available to bring us something we might need - while Papis is the manager of the site and was able to organise trips abroad with cars and was a lovely friendly person. We arrived to find a luxurious villa with the most breathtaking view from the infinity terrace - less than a 100 metres from the beach. 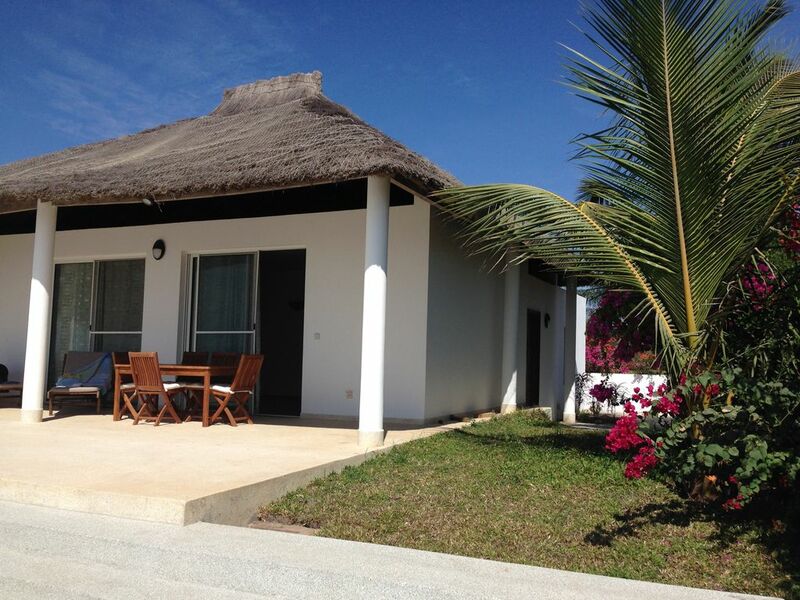 Each room has air conditionning and the master bedroom has it's own en-suite bathroom. I went swimming every morning and found only the odd european fisherman on the beach. The evenings are a delight - once the sun goes down the terrace became our main living area and we could cook and eat on the terrace by candlelight and then proceed to our most favourite passtime which was to watch the stars in the sky which feel like they are your own personal TV. I would highly recommend the villa and the lovely owner who arranged everything so smoothly for us." "Le site cap OUEST est absolument féérique. La villa est encore plus belle sur place. La vue est simplement imprenable sr l'Océan et l'équipe sur place (garde, gérant, jardinier) sont tous très compétents et encore plus sympathiques"
"La villa est neuve, bien équipée, et se trouve dans un enviroonnement unique, à l'abri dans un parc et en face d'une magnifique baie, avec une vue imprenable sur l'Atlantique ! De plus, une équipe de personnel gentil et serviable est à disposition pour aider en cas de besoins (conseils pratiques, bonnes adresses de restos, etc...)"